With the launch of National Health Insurance Protection Scheme, also known as Ayushman Bharat, next month, nearly 40% of the bottom rung of the Indian population will have a standard health insurance plan. This policy will stand out as it will have minimum exclusions, things that insurers do not pay for, unlike retail health insurance products that come with a lot of caveats. Sifting through all the policies in the market and reading all the fine print to buy one plan could be an intimidating task. Enter Mint SecureNow Mediclaim Ratings, which can help cut the noise and pick the policy that suits your age, stage and need. We bring you the 6th edition of our annual mediclaim ratings. MSMR rates health insurance plans that pay for hospitalisation. We split the ratings into three—A, B and C—and the categories are based on the sum insured or insurance cover, age of the person and the type of cover, individual or family floater that covers the entire family as one unit. The sum insured categories are ₹ 5 lakh, ₹ 10 lakh, ₹ 20 lakh and ₹ 50 lakh and the age groups are 30, 45, 60 and 75 years. For the individual category, we have rated policies across all age groups and sums insured. For floater, we took a family of three for the 30 years category and family of four for 45 years. Like we did last year, this year too we carved out a separate rating matrix for the 75 years category because plans are rated on the basis of the features we felt were more relevant to this age group. In all cases, policies are rated for three things: premiums, features and claims record. For age groups up to 60 years, premiums and claims get a score of 30% each, whereas features get a score of 40%. Compared to last year, we have shaved off 5% each from premiums and features and added 10% extra to claims. Claims is the final moment of truth for a policyholder, therefore the higher weight. For age categories of 30 and 45 years, we took out an average premium by considering premiums for other age bands. So if a plan is cheapest at 30, but expensive at 45 or, say, 60, the ratings will reflect it. It’s on this average health insurance premium that the policies are rated. This is important because you don’t want to buy cheap but pay more over a period of time. For the 30 years age group, we have averaged the health insurance premiums for 30, 45 and 60 age bands; for 45 years, we have averaged premiums for 45 and 60 age bands; for 60 and 75 years, we stuck to that age band itself and didn’t take an average of multiple age bands. We looked at features that enhance the level of cover and don’t spring a surprise at the time of claim. The initial waiting period on a pre-existing ailment and sub-limits on room rents are two elements of rude surprise, both get a score of 15% each, and policies with these restrictions score down. Then come features that enhance the level of sum insured. The “no-claim bonus" feature gets a total score of 5% and the “restore" feature, which reinstates the level of insurance cover if used in a policy year, gets a score of 2.5%. We included preventive healthcare (wellness), so that policies that induce positive health activity and reward customers either with a discount in premiums or with redeemable reward points get a 2.5% score. For 75 years, the ratings focus more on features that restrict cover. So we got rid of no-claim bonus and restore benefits and reallocated scores. Insurers’ ability to settle claims is very important and this year this parameter gets a sizeable score of 30%. This category is divided between claims settlement with a total score of 25% and claims complaints with a total score of 5%. For claims settled, we looked at the total number of claims on which a decision was taken and the percentage of claims that were settled. Insurers that settled at least 95% of the claims get the highest score and insurers that have less than 30 complaints per 10,000 claims get the highest score of 5%. The cheapest policies may not be the best ones. Compare premiums in tandem with other features, especially restrictions and claims settlement. Policies that are rated A or have a score of at least 65% will work well on most parameters. But don’t stop at A rated products. 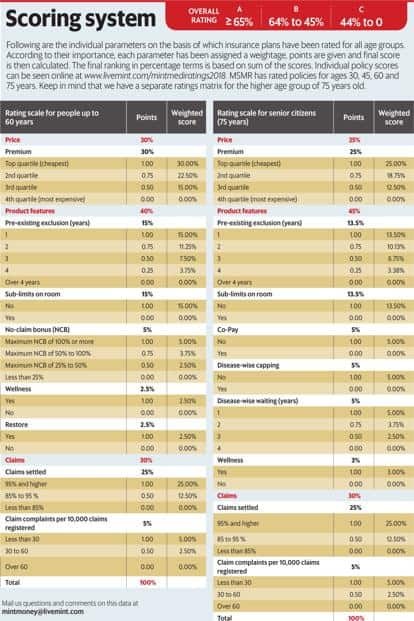 Look at all the policies we rated at livemint.com/mintmediratings2018. Find the premium you’re comfortable with and then look at other parameters to strike the right balance.